Trekking and climbing in the Atlas Mountains and Toubkal National Park is increasingly popular,catering for all levels of fitness and available for short trips or extended treks over a period of several days.It is an opportunity to see the Atlas mountains and its people, it is by far the most beautiful of Morocco’s diverse countryside, still largely unchanged from the time when it was remote and cut off from the ouside world. Walking holidays in the Atlas mountains often feature climbingf Jebel Toubkal, at 4,165m, the highest mountain in North Africa. This does not require expert mountaineering skills but does require a higher level of fitness and care should be taken when weather conditions turn difficult.The ascent during the end of the winter and spring (February/March) is more difficult. Crampons are necessary to ascend through the snow and ice. Mount Toubkal can be climbedin two days, first day up to the refuge (around seven hours without mules), second day to the summit (around five hours) and back to Imlil (up to five hours). you can of course take longer. Just up from Imilil is the Kasbah Toubkal which can be reached on foot or by mule. 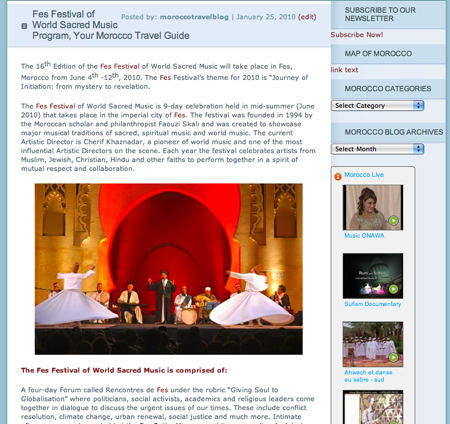 It is in an iydillic setting surrounded by moutains and with a view of Mount Toubkal. Hollywood movie director, Martin Scorsese, found it an ideal location for Kundun his film about the Dalai Lama, when it was temporarily converted into a Tibetan monastery. The view from the terrace of Kasbah Toubkal is stunning surrounded by the mountain scenery and the silence. The Kasbah Toubkal in its current form was recreated by Chris and Mike McHugo from the original rundown Kasbah owned by the local caid. Local workers from Imlil and surrounding villages built the Kasbah into an hotel with fourteen rooms with ensuite bathrooms, including a three-bedroom family house and separate Berber Salons, which although can be used on a dormitory basisfor groups. there is a conference centre for study groups. The rooms simple yet comfortable, with berber hand-woven carpets, blankets, intricate carved woodwork and traitional wooden ceilings. 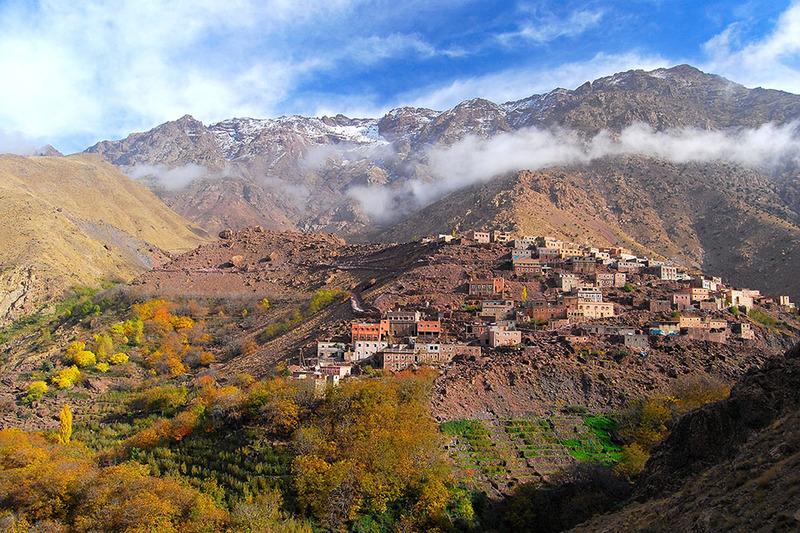 The Kasbah is an ideal base for climbing Mount Toubkal and trekking in the area. There is also a hamam to relax in after a hard day’s trek.The Kasbah and its local staff who run it provide an excellent introduction into Berber culture and local life. Guides for climbing and trekking are available and they provide you with a metal stick with a spike at the end which helps as you climb the steep slopes and rocky ground of the valleys. The Kasbah also has the Azzaden trekking lodge, a remote location on the outskirts of Ait Aissa in the heart of the High Atlas Mountains. It is close to a traditional village and has solar-powered underfloor heating and spectacular views a day’s walk away. Kasbah Toubkal has become increasingly popular so they havedeveloped alternative accommodation at Dar Imlil which is five minutes from the centre of Imlil. It has 4 standard double ensuite rooms and 6 double/twin de luxe rooms. Kasbah Toubkal is very much at the centre of local life contributing to schools and education forlocal women. ithas won numerous awards for sustainable and environmental tourism , involving the local community in all its activities and provding eemployment for the local community. italso plays an important role for raising funds for local education and child welfare. Many groups climb Mount Toubkal to raise sponsorship for charities . The Kasbah Toubkal is also involved in promoting sporting activities such as cycling and mountain biking which are increasingly popularinthe Toubkal National Park. There are guides and mules available in Imlil the village which is the gateway to Mount Toubkal and the Toubkal National Park . Sturdy boots and warm clothing are essential. There are two stone-built refuges (old Neltner Refuge and new Refuge du Toubkal) that are often used as base camp at 3,207 m (10,522 ft). There a wide range of trekking holidays available in Morocco such as the desert range of the Jebel Sahro in the south, the best area for trekking in winter along with the Anti Atlas. The Central Atlas is home to Morocco’s second highest peak, Jebel Mgoun.Walking through the Atlas mountains from Mgoun to Toubkal, passing through rarely trekked areas, many tiny villages and across high plateau and ancient and discovering ancient rock carvings in the Toubkal National Park is an unforgetable experience. 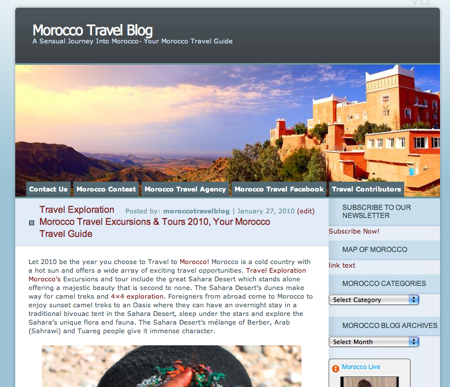 You are currently browsing the archives for the Morocco Travel Adventure category.